The concluding chapter of the current Planet of the Apes reboot trilogy just hit screens and has already received praise for its searing social commentary and bitterly true allegory (including some praise lavished onto the flick by yours truly). That’s all fair and well deserved. War for the Planet of the Apes is a great movie, possibly even the best blockbuster of the summer. However, it is a bit odd to see everyone acting as if it’s a revelation that the Planet of the Apes movies are suddenly smart and allegorical. That’s been true from the very beginning. It was just hard to see through all the loincloths and ape makeup. It’s not just the original Apes picture that’s worthy of praise for its clever weaving of social issues and talking monkey fantasy. Even the sequels cranked out in the 1970s—with increasingly smaller budgets and lower critical respect—were all rather brilliant and cynical meditations on the state of humanity as well. Most folks just didn’t notice because the Apes movies were routinely dismissed as kiddie stuff and a pop fad designed to tell toys (long before George Lucas made such things fashionable). That’s not true though. 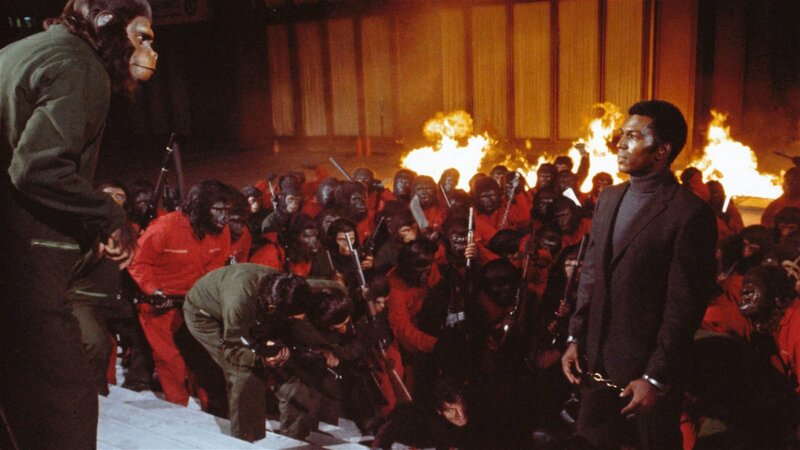 The Apes sequels (or at least three of them) deserve to be remembered as classics of dystopian 70’s sci-fi every bit as much as the original. Now that the new Planet of the Apes trilogy has drawn to a satisfying close, it’s time to look back on the forgotten Apes franchise entries that were actually pretty damn good themselves. So let’s do that, shall we? Whoo boy! Here’s a weird one. After the success of the original Planet of the Apes the studio wanted a sequel, and even though everyone involved desperately tried to point out that the narrative was complete and there was nowhere to go, they persisted. Charlton Heston eventually—and reluctantly—agreed to appear, but only in a brief role and under the condition that his character dies. So screenwriter Paul Dehn (who wrote Goldfinger and was the architect of these three fascinating sequels) was in a tricky position. The first half of his movie was essentially a remake with a new and far less interesting collection of astronauts landing on a future Earth, getting kidnapped by the apes, etc. It feels like a cheap rehash and cash-in, almost worth ignoring entirely until things get absolutely insane. Eventually, we learn that there are indeed humans still living on the Planet of the Apes, but they live underground in the ruins of New York City. Their skin is unsettlingly melted, they have telepathic powers, and they worship a giant nuclear bomb. The story cleverly (and often clumsily) explores their cultish nihilism in contrast to the apes’ bigotry and has some intriguing ideas buried within the acid-tinged insanity. Beneath The Planet of the Apes is not the best of these sequels, but it is the most insane and nightmarish, springing from decades of cold war paranoia and the distinctly 70’s brand of political cynicism that would define the franchise going forward. Watching the movie feels kind of like falling asleep halfway through a bad PotA flick and then having a nightmare vision of a sequel that no one would dare to make. Yet, in the 70s FOX did make it and everyone was so convinced that there would never be another PotA movie that it concludes with Charlton Heston detonating the mutants’ nuke and blowing up the entire planet. You’d think that would be the end of the series….yet somehow you’d be wrong. So, how do you make a sequel after blowing up the entire Planet of the Apes? Easy, you take two of the most popular ape characters that skipped the last movie (Roddy McDowall’s Cornelius and Kim Hunter’s Zira) and have them board a ship before the blast and get sent back in time to the 70s from that explosion—no, it doesn’t make any sense. You just have to go with it. And then just when you start thinking that writer Paul Dehn has jumped so far over the shark that he can’t possibly return, the flick gets quite good. The funky 70’s humans are instantly fascinated by these talking apes that quickly grow from scientific oddities into national celebrities. Cornelius and Zira become popular talk show guests, get wined n’ dined by politicians, and engage in wacky shopping montages. It’s all absolutely hilarious and a delightfully campy parody of the cult of celebrity circa 1971. Then just as Escape From The Planet of the Apes starts to feel like a comedy, Dehn and director Don Taylor slowly reveal their true plans. After the apes let it slip that their race will one day conquer mankind, Washington becomes terrified that these two genius monkeys will start a revolution. So, Cornelius and Zira quickly turn from beloved pop icons into hunted enemies of the state. It’s a pretty searing exploration of bigotry and mass panic that finally puts direct onus onto human nature as a cause of those tragic flaws rather than letting it out through ape allegory. The whole thing builds to one of the bleakest and most unsettling finales of the entire series, which somehow feels even more disturbing after all of the goofball shenanigans that precede it. Beneath The Planet of the Apes doesn’t feel so strange after Escape is all over and somehow Paul Dehn executes a master plan that spins this story into an origin of the entire series. It’s a wacky and insane sequel and one that desperately needs to be seen to be believed. Finally, we get to the other masterpiece PotA movie from the initial run of the series. After the wacky third chapter, Paul Dehn gets damn dark to deliver a monkey thriller that could only come out of 70’s Hollywood and one that went on to inspire the new Planet of the Apes blockbuster trilogy. Set a few years after Escape, a bizarre disease has killed off all the cats and dogs so humanity starts bringing home apes as pets. Slowly those apes became slaves and eventually, an entire slave class. 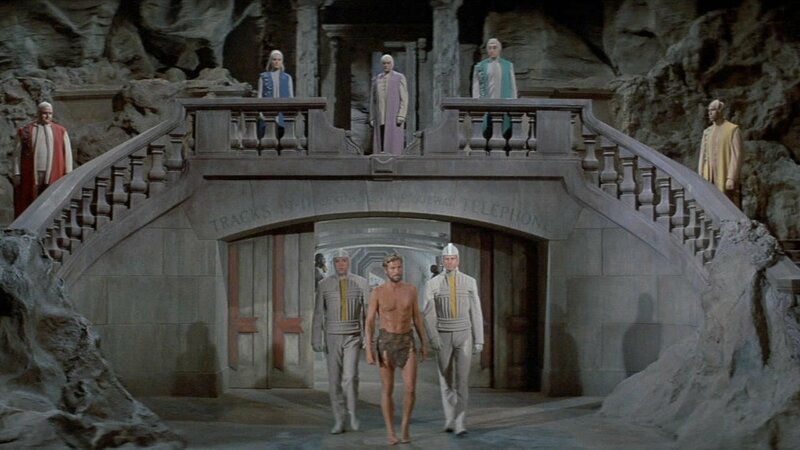 Roddy McDowall returns as Caesar, the orphan child of the two Apes from the last movie now all grown up. He can speak and has the intelligence of his parents, so he’s acutely aware of how horribly apes are being treated. He starts a revolt and somehow viewers find themselves on the side of the apes when it comes down to a great riot that will change the course of human history. So, it’s not exactly the cheery and campy romp that we remember the old Apes movies as being. Directed by J. Lee Thompson (who also helmed the original Cape Fear and was the best filmmaker to ever work on the initial series), this is a harsh and brutal movie that deliberately invokes images of the race riots of the late 60s and early 70s in its climax. This is an angry cry against racism and inequality that just happens to be a Planet of the Apes movie—and a damn brilliant one. The filmmakers took advantage of their budget limitation by turning the cement 20th Century Fox offices into a sterile dystopian future that feels cold and disturbing in all the right ways. The film’s climax is so dark that the studio forced a softer ending and dulled the blood on the carnage, but thankfully the recent Blu-ray release restored the director’s cut and confirmed Conquest of the Planet of the Apes to be a forgotten 70’s sci-fi masterpiece. The new PotA movies wouldn’t exist without this absolutely brilliant film that is desperately deserving of rediscovery. Of course, even with the truncated and softened climax, Conquest proved to be a surprise hit and a final war movie sequel, Battle For The Planet of the Apes, was produced. Aside from a couple decent action scenes and the surreal casting of legends John Huston and Paul Williams as apes, the movie isn’t really worth looking at for anyone other that PotA completionists. That’s also true of the live action and animated TV series that followed and especially of the lacklustre Tim Burton reboot from the 90s (a movie with easily the best ape makeup in the franchise and nothing else worth mentioning). Truthfully, it wasn’t until 2011 that this series got good again with Rise of the Planet of the Apes, and with each sequel, the new PotA blockbusters have gotten even better. There’s been a tendency amongst some fans to claim that they are the best PotA movies since the original, but that’s only true if you haven’t seen the original sequels. So if you find yourself jonesing for some more monkey mayhem after watching the brilliant War for the Planet of the Apes, do yourself a favour and dip back in time to watch Beneath The Planet of the Apes, Escape From The Planet of the Apes, and Conquest of the Planet of the Apes. You’ll be surprised. This franchise has always been brilliant, it was just easy to forget once the series became a quaint n’ campy piece of pop culture history.